Using specially designed Argos transmitters, an international team of researchers has been tracking elephant seals in their feeding grounds, gathering unique information about the Southern Ocean in the process. Transmitters tagged to elephant seals using a resin fall off naturally, usually when the seal moults. Credits: MNHN-CNRS/SMRU-SEaOS. “Elephant seals are remarkable divers that can go deeper than 1,500 m,” enthuses Christophe Guinet, a marine biologist at the French scientific research centre CNRS. But despite such prowess, certain colonies of elephant seals are in decline. For example, colonies in the Kerguelen and Macquarie islands near Antarctica have fallen by half since the 1970s. 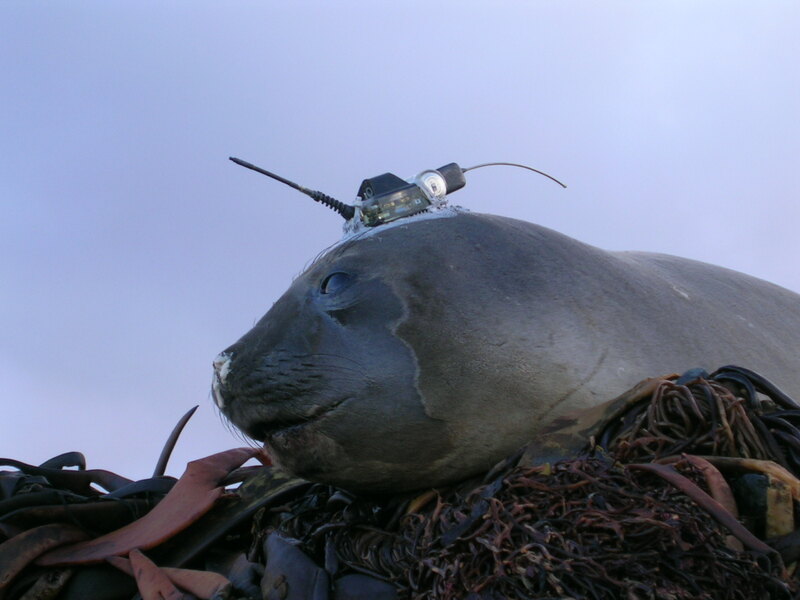 To unravel this mystery, Christophe Guinet and his colleagues in the United Kingdom and Australia decided to tag 40 elephant seals with unique Argos transmitters (operated by CNES subsidiary CLS). “These new-generation transmitters* allowed us to track the seals’ movements, study their behaviour during dives and measure sea temperature and salinity,” he explains. Transmitters relay the seals’ location. They are also equipped with pressure sensors to record dive depths, as well as miniaturized temperature and salinity sensors. Credits: MNHN-CNRS/SMRU-SEaOS. 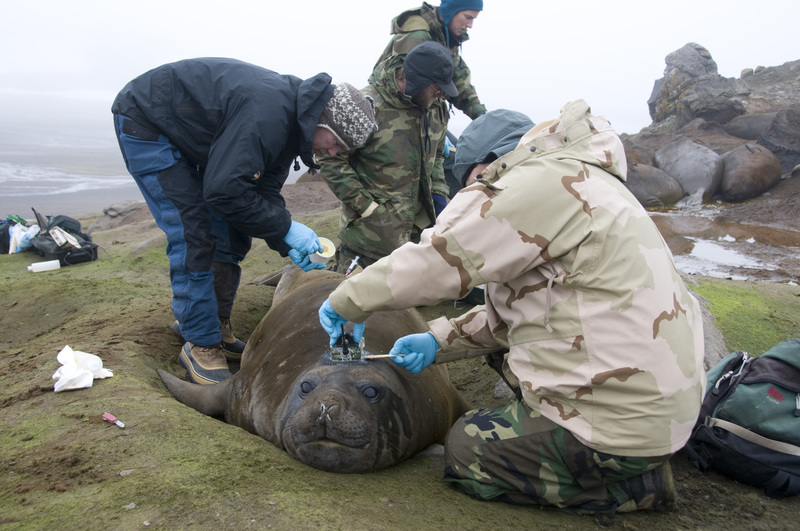 Every time an elephant seal surfaces to breathe, the data collected by its transmitter are sent instantaneously to the biologists via satellite. After tracking seals for 3 years, the researchers noticed that the declining populations in the Kerguelen and Macquarie islands were feeding mostly near the Antarctic sea ice. The problem is that in the 1970s the sea ice shrunk by about 6 million sq.km, meaning fewer algae and krill**, and therefore fewer fish for the seals to feed on. The elephant seals feeding here would therefore appear to have suffered from a scarcity of food. 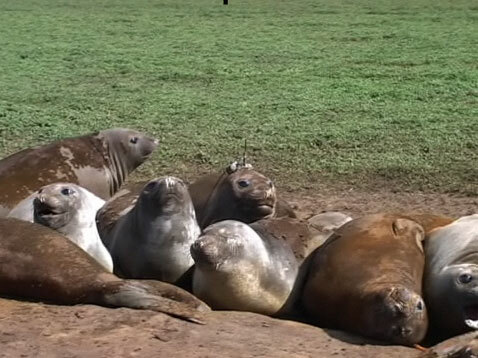 Oceanographers have also been following elephant seals’ movements with interest. This is because these peerless divers spend 90% of their time under water and swim in the ice zone bordering the Antarctic land mass, where boats can’t reach. The seals’ transmitters have collected 16,500 new temperature and salinity readings in record time, helping researchers to describe precisely the ocean currents that originate here. These currents are a key element of global ocean circulation and climate patterns. Elephant seals spend only 10% of their time out of water. Credits: MNHN-CNRS/SMRU-SEaOS. What’s quite extraordinary is that as they explore the seasonal ice zone in the Southern Ocean, the elephant seals are giving us the 1st hydrographic data associated with sea ice formation,” says Gilles Reverdin, an oceanographer at CNRS. Looking further ahead, researchers hope to track variations in sea ice thickness and the impacts of climate change on this region of the globe. * Developed by the Sea Mammal Research Unit in Scotland. ** Type of shrimp-like marine invertebrate animal.